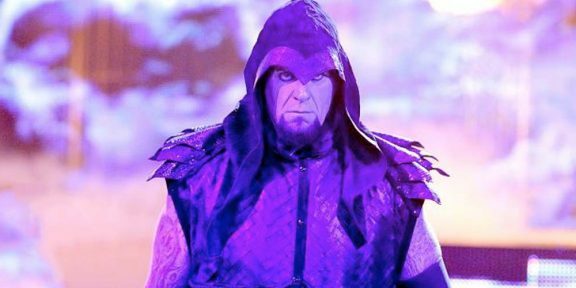 The Undertaker returned to the ring last night at Madison Square Garden, his first appearance in the iconic arena in eight years. Taker teamed up with Roman Reigns and Braun Strowman to take on Elias, Kevin Owens, and Baron Corbin. The entrances of Strowman, Reigns, and Undertaker took a whopping 11 minutes and the match lasted another 15. The Undertaker stayed on the apron until the big hot tag from Roman Reigns 12 minutes into the match. After tearing into Kevin Owens, Taker tried to chokeslam both Owens and Elias at the same time but Corbin made the save. Taker then grabbed Corbin by the neck and threw him into a Roman Reigns spear and Elias ate a running power slam from Strowman. Kevin Owens then got a chokeslam and a tombstone piledriver as Taker pinned him for the win. After the match, Taker shook hands with Strowman and the Money In The Bank winner left the ring, leaving The Undertaker and Roman Reigns alone. After a face-to-face, Taker and Reigns shook hands and left the ring. This was The Undertaker’s third time wrestling this year following WrestleMania 34 and The Greatest Royal Rumble.